The year 2018 is about to get better as the biggest occasion of great celebrations is just a few weeks ahead of us. With the onset of Ramazan as the blessings tend to spread everywhere in the country, so does the worries for the Eid Couture. All the eminent clothing lines, brand, and designers have launched their latest Eid collections in the market and surely we all are overwhelmed with the immensity of designs and varieties. On one hand, it is always great to have lots of choices available for a nice outfit, while on the other hand, it is also a bit confusing for others. Well, with this article, we all can get a clear idea of the latest simple stylish Eid dresses trends and decide it for ourselves. Weather is the most important element which has a lot of say in deciding the clothing trends for us. As this year, Eid and scorching heat waves are coming hand in hand, we need to be smarter about our clothing choices. It is important to keep the style light and simple while keeping a bit of the glam. A right choice of fabrics and perfect blends of colors is a road too well-styled celebrations. Where most girls prefer simple and beautifully printed lawn dresses for the day, others are more interested in embroidered chiffons or printed silk. Well, there are numerous ways into which we can style our favourite type of fabric into the desired shape. This year there has been an influx of new designs, from simple medium length shirts to funky frocks and kurtas, every design is equally loved by all. Moreover, there is a number of bottom styles available to pair your tops with from fringe trousers to cigarette pants, bell bottoms, tulips, pencil pants and etc. Unlike many previous years, the patterns of styling for this year is quite different as there is no single design which is going to dominate the rest of the Eid trends rather, a number of styles are bulged up together to form the entire series of Eid Collections. Within a single Eid Catalogue, you might find a variety of designs with distinctive appeal and a different outlook. 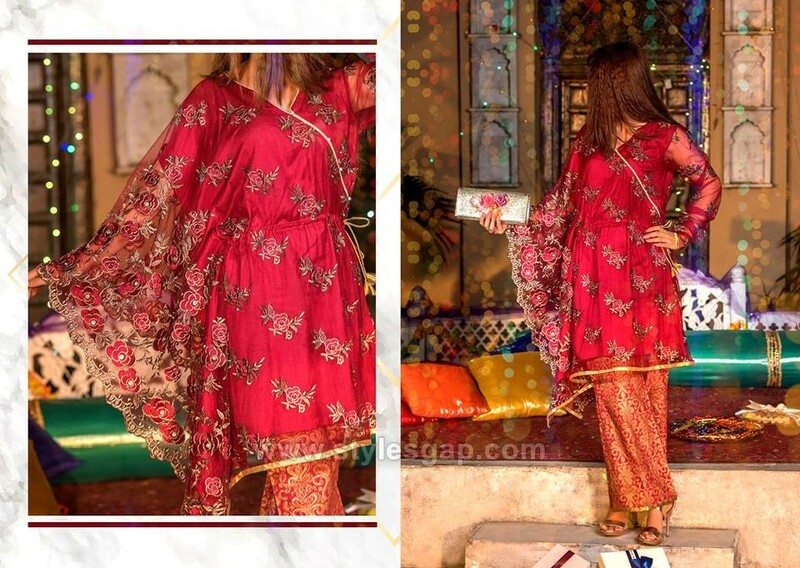 Eminent brands of the country have now set into motion and there are tons of fashion lit Eid Ul Fitr dresses covering the pages of their catalogues. From Sana Safinaz to Nishat, Agha Noor, Khaadi, Maria B. Gul Ahmed and many others have launched the unstitched and stitched collections out there. Whereas the special pret suits are more preferred for the day. These pret collections comprise of all the possible designs from simple shirt trousers to frocks, peplums etc. Stylize the special celebrations with the colours of ultimate sophistication. Considering the weather, go for soft and pale colours for the day whereas bright neon colours are great for evening wear. Sharp and loud colours are great for the day however mellow shades of white and beige are perfect when crafted with minimal embroideries. If you are probably planning to get a nice and comfy lawn dress to celebrate Eid this year then you are not probably along in this. Considering the temperature rise, this is the best option to go for. For celebrations at home, these suits serve best as they are comfortable to carry around even when you need to work in the kitchen. Though printed apparels are sufficient to meet the style need of the day, however, there are many varieties which are available with a little embroidery, lacework, applique and mixed medium sleeves. The refreshing shades in the lawn collections are mesmerizing and soothe you to the core. So if you are planning to get one for this Eid then start putting into some thoughts and start shopping. Glancing at the fancy new Eid collection by Maria B. you would probably end up wanting a gleaming Eid dress for the day. Whether crafted with embroideries or in monochromatic shirts, chiffon has a texture that moves us all. These dresses also look great when designed in white or variety of its shades. 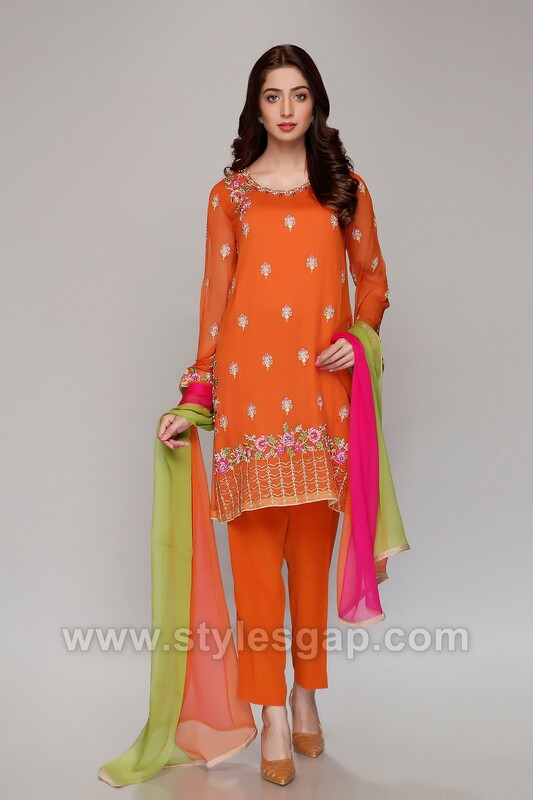 It’s not just Maria B. in fact number of Eid pret collections are making excellent use of chiffon this year. The simple embroidered shirts are paired with flared bottoms. It is best to carry any baggy style, either if it is peplum or frocks. Mixed medium chiffon dresses are also in for the Eid style as they are designed by paired chiffon with cotton, lawn or silk. Kurtis is next to new Eid trend in town. They are so comfortable and convenient that girls of all ages prefer them over all sorts of apparels. Moreover, Kurtis can be paired with any form of the bottom, so you get to choose any possible combination. As of the kurta designs launched by Pakistan’s top notch clothing line, they are exotic and amazing. Floral Kurtis by Agha Noor is going to be the next big hit of the Eid season whereas simple yet funky, the Kurta shirts by Khaadi, Nishat, Sapphire and Sana Safinaz are all making big news in the fashion circles of Pakistan. Either it is in home functions to outdoor Eid celebrations, these pro eastern Kurtis are perfect for each setting. 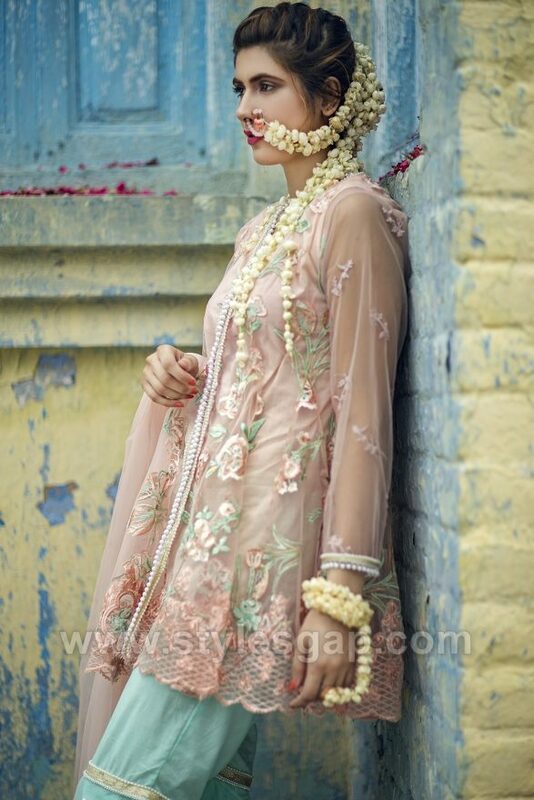 It has been quite some time since traditional wear has hit the mainstream fashion trends in Pakistan. Almost no occasion is complete without some hints and colours of our ethnic wears. 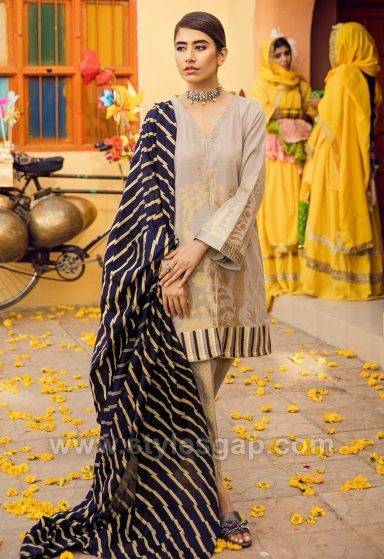 Sharara pants, peplum tops, fancy angarkha, gleaming shalwar kameez, baggy or tulip shalwars with short or medium shirts, these are all some familiar style trends and they are about to turn your Eid into a day full of glam and glitz. The traditional apparels also include Afghani shirts and special Afghani frocks. With the mere use of traditional embroideries, even a simple suit can be turned into a full-fledged desi outfit. Carry them with a nicely embellished khussa and you will look ravishing. An immensely popular trend which is opted by most of the top-notch designers and brands while crafting their Eid collections. The idea of short frocks greatly resonates nicely with a classic voluminous outlook which looks great with smart bottoms. Moreover, short frock looks great on every height. Especially the girls with short heights look magnificent when they carry short but voluminous frocks. No matter what kind of fabrics you want to carry, these can be crafted using any texture, from lawn to cotton to silk or even in chiffon. With or without a dupatta, these frocks look equally great in both ways. There are ways in which you can add variety to the pleating style, short yolk frocks, medium yolk frocks and frocks with full pleats, all are equally in trend. The style which has garnered much of our attention is the asymmetric style in which the shirts of varying length and no prominent border shapes are designed. These dresses look phenomenal and uniquely distinctive. Low high shirts are also the most popular style of this trend. This Eid try these asymmetrical dresses with hints of embroideries around the neckline or some floral applique work. The beauty of these dresses is that they can be crafted almost in any shape with the full extent of creativity. You can play with the size and shape of the sleeves and volume of the shirt. The bottoms are however kept simple and straight to simply highlight the tops and their design. The infamous digital prints never go out of style and on every Eid, they return to the fashion catalogues with even more style and variety. As there is almost to end to human creativity, same is true for digitally printed shirts. The mix of quintessential floral patterns and imperial architectural designs makes these digital prints amazingly unique. For full suits, the digital prints follow a single theme and pattern which extends throughout the shirt, bottom and dupatta while a proper balance is kept between these three. For single shirts, the prints are more diverse and distinctive. They reflect an amazing contrast of both the regal and the casual. Dazzling bright colours and prominent bold patterns are going to blow your mind away and will make you skip your heart beat. 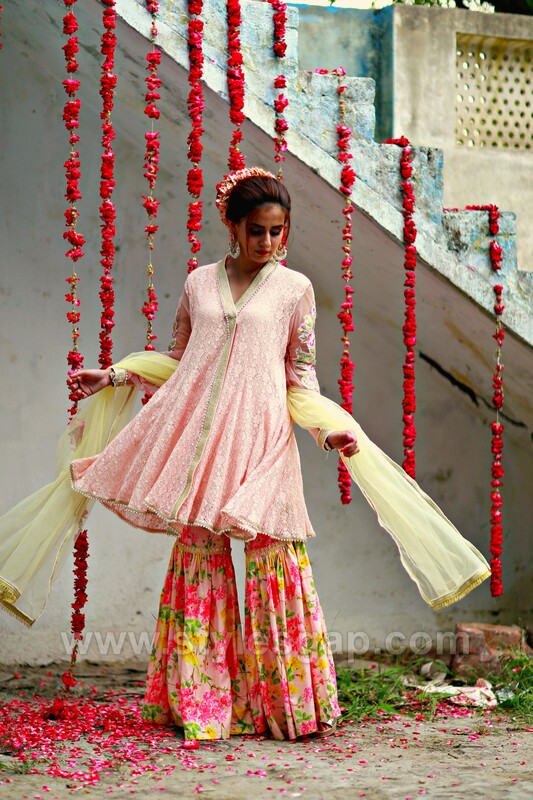 This is Eid the fascinating Neon display will also be on the rise with appealing hue and simple block prints. In these outfits, the use of abstract prints is also popular and is greatly loved by the girls of young ages. Whether you design a long frock, shirt or tunic, these amazing colour will spark a mesmerizing look in you. Such outfits are great to carry with your favourite accessories and minimalistic style jewellery. We all can never get enough of peplums. That is quite true, as its fashion keep hitting back and back with new ways to amaze us. Peplum tops are going to be great for this Eid, which is evident considering all the latest Eid collections. Every other pret collection celebrates the beauty of peplum shirts with such a delight that you will definitely fall for them. To keep it more casual try something in cotton, lawn or chiffon, whereas fancy textures are good to make it more formal. Embroidered organza is also great to design good peplum out of it. When it comes to peplum, flared and voluminous bottoms are must to carry with. Bell bottoms and sharara pants perfectly complement them. Loose wrap dresses make excellent use of nice and decent wait belts. For those who love to carry belts, this option is definitely for you. However belts are not the only style to carry loose wrap shirts, tie knots are also used to carry them in alluring style. There are two ways in which such apparels are designed, firstly as a simple asymmetrical loose shirt and other as a loose upper. Both look good and goes with smart and fit bottoms. Straight pants and trousers have to be paired with loose wraps. With these dresses, convenience is surely guaranteed and you can look ravishing even without the use of heavy embroideries. The emblem of beauty and style, silk tunic are another name of class and sophistication. The soft and light silk is best to complement any body shape and type. Thus they are popular among women of all ages. The smooth and graceful silk tunics look enticing due to their mellow gleam. And if they are printed using a nice palette then the deal becomes irresistible. In silk, the tunics are designed in the good shape but with loose stitching and hanging sleeves. Off shoulder silk tunics and bellow sleeved are most popular ones. While opting for silk tunics, go for the ones with bold prominent prints. Surprisingly, the moderation has reached that peak in the fashion industry that the medium shirts have grown significantly popular among the masses. Length has always been the experimental element for the fashion industry and after quite long the medium shirt style has taken the spotlight. Whatever stitching style we may prefer, this length looks phenomenal on every one. Amazingly it also looks with all the bottom styles currently in trend. To bring diversity to the style, we can surely play with the style of the sleeves and the curves of the borders. I hope you enjoyed these latest eid dresses trends. Keep following us for more.